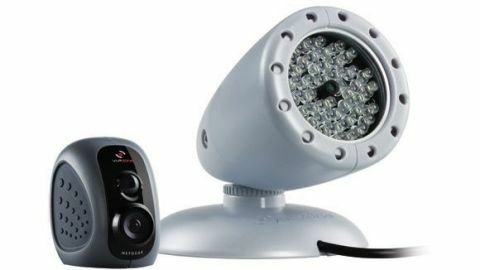 Netgear is putting strangers lurking in the dark outside of your home on notice with the VueZone Wireless Night Vision IP Camera it showed off at CES 2013. This tiny night vision camera is an add-on to the personal video network bundles that Netgear sells, like the popular Netgear VZSM2700 package. Inside of the new VZCN2060 box is a wireless motion sensing night vision camera that detects moving subjects up to 15 feet and a wired infrared lamp that can illuminate up to 25 feet. The fact that the night vision camera and the IR lamp are separate gives homeowners creative control over where to shine the invisible infrared light outdoors. Sensitivity of the motion sensor can be adjusted via a sliding scale on the computer or app, and email alerts can be setup to send still images or short video clips every time a detection is made. The hassle-free, wire-free advantage that Netgear's personal video network has over its competition makes it a compelling choice. However, Netgear said that the VueZone is not intended to be used as a security or surveillance device. Continuous 24/7 streaming of video would quickly run down the tiny camera's battery. The Netgear VueZone battery life is supposed to last six months with "normal usage." Digging deeper, TechRadar found out that this is defined as five minutes of viewing per day. That's more than adequate when you're going away and the camera isn't set up in a location that will consistently pick up motion. However, the VueZone's battery life isn't going to work for everyone like a wired security camera would. Netgear curtained-off a portion of its CES 2013 hotel room in order to demo the VueZone Night Vision IP Camera add-on. The night vision camera, pointed at the pitch-black sink area just outside the hotel's bathroom, picked up a Neatgear employee sneaking into view. He showed up clearly on a nearby laptop in 640x480 resolution video. As a result, no free hotel soaps were taken by the employee. This simulated test was immediately trumped when Netgear touted a real-world situation in which a Tampa Bay man caught neighborhood burglars using the VueZone camera system and a separate alarm system. The would-be thieves were eventually caught thanks to the images provided by the VueZone camera. A VueZone account can accommodate up to 15 cameras and store 500 MB of video and still images. But that's with the highest-tiered Elite plan - it costs a not-so-obvious $79.99 yearly fee. For most people, the $49.99 Premier plan, which can be paid monthly and includes support for up to five cameras and 250MB of storage, will be enough. There's a free plan, but it supports only two camera, live video via the computer (not through a smartphone app), and lacks digital pan and zoom functions and video email alerts that the other paid plans come with. The VueZone VZSM2720 bundle from last year came with an outdoor shell in which a single magnetic camera could be housed inside a protective plastic case - perfect for outside. However, the picture quality was never ideal for nighttime conditions. That's where Netgear's VueZone Wireless Night Vision IP Camera comes into focus. It too can be combined with this outdoor shell to survive 14º to 122º F (-10º to 50º C), but also provides a cleaner image of what's happening in the dark. Combined with its daytime camera counterparts, this night vision camera add-on can be set up in ten minutes with no technical knowledge required. None of the VueZone wireless cameras from Netgear are meant for 24/7 monitoring, but they do provide the easiest, most affordable snapshots of your home, pets, kids, etc. And now all of these things can be seen at night time, too.